This very classic and super easy quiche Lorraine is perfect for first-time bakers and quiche enthusiasts. Only the basic ingredients are included, making it easy to customize with other flavors of your choice! Classic quiche Lorraine is one of those foods that have stuck with me throughout the years. Maybe that’s because it was one of the few “non-hotdog” foods my mother was able to get me to eat. Maybe because my mother always brought a quiche with us when we went to visit my grandmother. Maybe because a well-made quiche is pure comfort food. But no matter the reason, mastering a classic recipe of this savory tart has been on my cooking to-do list for much longer than I’d like to admit. And, you guys, I finally found an easy recipe that I like. Or, more importantly, one I like enough to share with you. Plus, this recipe makes for an excellent base for all the other delicious quiche recipes out there. It is a savory tart filled with an unsweetened egg custard, cheese, and bacon. Other ingredients are a common addition, such as seafood, veggies, and other types of pork. Despite what the name sounds like, this dish actually originated in Germany. It started simply being called quiche (from the German word kuchen, which means cake) and made of an egg custard and pork. It wasn’t until later that cheese was added and the French renamed this dish “Lorraine” (after a providence where it first became popular). The current moniker is a combination of the two, representing the recipe we know today. What else can you put in quiche? I’m personally not a fan of freezing quiche due to the dairy content and creamy consistency, but it can be done. This dish can be frozen both before or after being baked. If freezing before baking: Carefully place prepared quiche in the freezer. Allow filling to freeze solid, then transfer to a sealable freezer bag. Unbaked quiche can be frozen for up to one month. When ready to serve, do not thaw. Just unwrap and bake as normal, adding 10-20 minutes to the cooking time. If freezing after baking: Place baked quiche in the freezer and allow to freeze solid. Transfer to a sealable freezer bag. Baked quiche can be frozen for up to three months. When ready to serve, do not thaw. Warm in the oven at 325 degrees F for about 25 minutes or until heated through. Should this be served hot or cold? For the best taste and consistency, quiche should be eaten soon after it’s made, ideally warm (or at the very least, above room temperature). If you’ve chilled or frozen the quiche, it should be warmed before serving. When should you serve quiche? In most cases, quiche is served as a brunch or lunch dish. However, you could totally make an argument for this to be served for breakfast (due to the eggs) or dinner (due to the cheese and savory nature). Ultimately, the choice is up to you – there is no “wrong” time to enjoy this savory tart. When baking recipes with crusts like this, I like to buy (or make) the pie crust separately so that I can use my own pie dishes for an extra touch of character. I have a simple white pie dish similar to this one that always gets the job done. Step 1 – Prepare your other ingredients, such as cooking and crumbling the bacon and baking your chosen pie crust. Set both of these nearby for the next steps. Step 2 – In a large bowl, add the eggs, heavy whipping cream, salt, white pepper, and ground nutmeg. 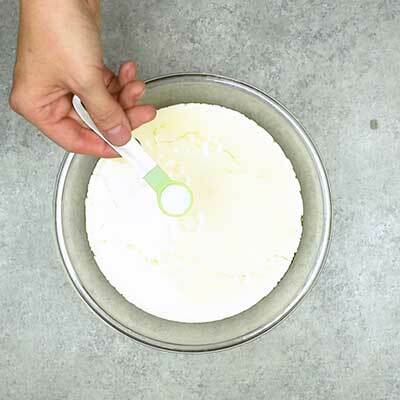 Use a whisk to gently break apart the yolks and mix until the ingredients become a creamy yellow color. Step 3 – Bring your baked pie crust over and begin layering ingredients – first the bacon, then half the shredded swiss cheese, then the green onions. Carefully pour the egg mixture on top, then top with the remaining swiss cheese. Step 5 – Let cool for 15 minutes, then enjoy! Preheat oven to 425 degrees F. Fit pie crust (or crust of your choice) into a 9 inch pie pan. Use a fork to prick bottoms and sides of crust. Bake crust for 6 to 8 minutes until lightly browned. Transfer pie crust to a wire cooling rack to cool slightly. In a large bowl add eggs, heavy whipping cream, salt, white pepper, and nutmeg. Whisk until yolks are broken and mixture is a solid yellow color. Set aside. Bring still-warm pie crust to workspace. Add bacon to the bottom of the pie shell, then top with green onion and 1/2 cup of the swiss cheese. Slowly pour all of the egg mixture into the pie shell. Sprinkle remaining 1/2 cup swiss cheese on top. Bake for 35-40 minutes or until the middle of the quiche is lightly browned. Transfer quiche Lorraine to a wire rack to cool for 15 minutes, then serve. Super yummy, although I substituted Swiss with cheddar. Thanks for sharing!